A light and refreshing Gemma farm lettuce with radish, olive, onion, shrimp, and Gorgonzola dressing at La Balena. Foodies near and far appreciate the region’s celebrated chefs and eclectic menus — and its commitment to sustainable food. Thanks to the Monterey Bay Aquarium’s Seafood Watch program, established in 1999, many restaurants serve only ecologically conscious catches. This same philosophy carries over into the locally sourced produce that makes its way from the fields of the Salinas Valley to your plate (Monterey is, after all, only a 20-minute drive from Castroville, the “Artichoke Capital of the World”). We’ve rounded up a few of our favorite fresh finds, from classic comfort meals to dishes with a culinary twist, to try during your visit. At Wild Fish, there’s something new and fresh daily. This tempting lingcod pairs well with the chef’s cauliflower purée, braised leeks, purslane, and onion ash. 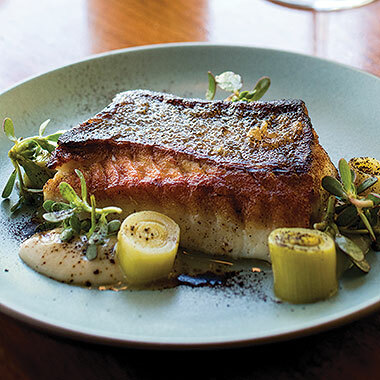 Its first incarnation was in Mendocino County, but ever since Wild Fish found its second home in Pacific Grove, the buzz over this exceptional dining outpost has continued to grow. You see, Wild Fish has mastered the art of offering something new. Every day, the venue features only premium organic foods, which they purchase directly from local purveyors. Owners Kelvin and Liz Jacobs have established such solid relationships with county farmers and local fishermen that their names actually appear on the menu alongside the food dishes featuring their bounty. Liz, a longtime food writer who believes “food transforms people,” says she often receives texts from fishermen out on the bay at 2 a.m. informing her of a great catch. “What’s on the table is not even 24 hours out of the water,” she says. With a menu that shifts daily, something always stands out. A tempting starter may include a delicate squash bisque made from roasted kabocha squash, with mojo ajo and ancho adobo. A pea salad will entice with its garlic-marinated snow peas, green garlic, ricotta, rhubarb vinegar, fresh horseradish, and hazelnuts. Fresh-baked bread is plentiful here — that, too, is organic and made in-house daily. As for the venue’s signature fish plates, every day is different yet equally delish. On a Wednesday, for instance, swordfish may be paired with creamed dandelion greens and tarragon beurre monté, along with a glass of Handley 2015 pinot gris. Come Thursday, the culinary tide changes, and one may find a succulent red snapper, roasted on a cedar plank to get that perfect coriander crust. Fresh fish creations may even morph into a fabulous shellfish boil, featuring half a Dungeness crab, salt spring mussels, wild white prawns, fresh manila clams, fennel, fingerlings, and a Caribbean-spiced coconut broth. These nuances, and an ever-changing menu, create a dining experience that is both novel and downright remarkable. The concept behind the 2-year-old spot is compelling: Clever Indian dishes given a coastal Californian tweak. The edible execution from decorated chef and New Delhi native Bhupender Singh reveals why he’s been a local treasure for more than a decade. We recommend the popular lunch buffet and dishes like avocado-pomegranate chaat, pistachio-chicken korma, and lobster marsala. Though it’s one of the area’s newest hot spots, this wildflower has roots that run deeply in founding Big Sur Bakery chef Philip Wojtowicz and former Big Sur Roadhouse top toque Brendan Esons. They provide the spirit behind the soulful food — think smoked-salmon-wrapped scallops, braised lamb, and roasted rock cod — in a central downtown Pacific Grove joint appointed with earthy tones, wood, and brass. Executive chef Paul Corsentino runs the kitchen. The wide patios over the Pacific are still one of the better places to sip and nibble. But with new Alila resort managers and some time to kill with the Pfeiffer Canyon Bridge out last year, Ventana resort renamed the place, reinvented its deck with a sleek design and gorgeous new bar, and redid the menu. Highlights include grilled abalone with Dungeness crab, chickpea panisse, smoked pastrami beef tongue, squid-ink-octopus fettuccine, and a 10,000-bottle wine cellar. 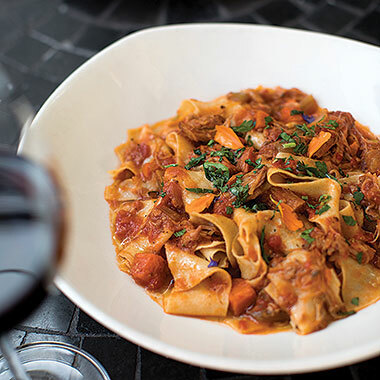 Primi della Casa means “first of the house.” It makes sense, then, that it’s the title of a signature La Balena dish that offers a wonderfully prepared pappardelle with wild boar ragu. For those who truly know (or wish to truly know) Italian food, La Balena delivers a feast of surprising classics. Frequented by Italians and locals who have traveled extensively in the “Boot,” the restaurant celebrates the regional cuisines of Italy that are largely absent from typical Italian restaurants in the United States, where the food can be more accurately described as Italian-American, or perhaps Southern Italian, explains Anna Bartolini, who co-owns La Balena with her husband, Emanuele, who hails from Florence, where his grandmother owned a restaurant. She cooked with fresh ingredients procured daily from the local market — an approach Emanuele follows at his own establishment, where he makes everything, including the pasta, from scratch each day. The lasagnette with pork bolognese and besciamella, for example, follows the Tuscan tradition of using a creamy white béchamel sauce. Meanwhile, one of the most authentic Florentine offerings, chicken liver fegatino, wins fans for its simple yet deeply satisfying serving of chicken liver in vin santo, a Tuscan dessert wine, served over toasted bread. “Authentic Italian recipes rely on using as few ingredients as possible for a dish, highlighting the quality of the ingredients over complicated recipes,” Anna notes. The fried cauliflower, sourced from Hollister’s Swank Farms, is such a customer favorite that the farmers were initially surprised by how much of the vegetable the restaurant was buying. 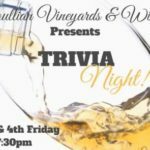 Fittingly, the wine menu is an impressive collection of Italian wines, with a few of the owners’ favorite local pours thrown in for a California touch. It’s all about brunch at this playful eatery, where you’ll have a hard time choosing between savory (like rich eggs Benedict and the popular fried chicken) and sweet (think waffles with spiced apple and toasted pecans). Pair with one of the many indulgent adult beverages, then perk up with an artfully made cappuccino from the espresso bar. From small bites done right, like dolmas and hummus, to a selection of soups, salads, flatbreads, and sandwiches, this wholesome Mediterranean-fusion café is your go-to for vegetarian, vegan, and gluten-free eats. Wash a Saffron Bowl (roasted vegetables over rice in a garlic tahini sauce) down with a rosewater iced tea and follow it up with walnut-stuffed dates. Upscale Californian fare served in a lively setting, with memorable takes on favorites — like lobster nachos, truffled gnocchi, and peach-chipotle glazed salmon — courtesy of executive chef Santos Bautista. 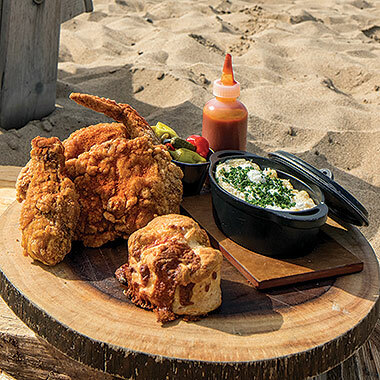 The chef’s expert take on fried chicken, complete with a side of polenta, is just one of the many standouts at Saltwood, nestled within Sanctuary Beach Resort and just steps away from the shore. 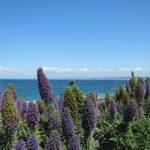 Just 10 miles north of downtown Monterey, the Monterey Bay laps up against a vast swath of sand dunes known as the Marina Dunes Reserve. The smooth peaks and valleys of the dunes are blanketed in a subtle cover of native plants that sway in the breeze, giving the sense of utter remoteness. And there, rising like a beacon in the curvatures of sand, stands Saltwood Kitchen & Oysterette, adding a pop of intrigue to the serene surroundings. Executive chef David Baron is especially fond of how the establishment presents itself at night, when it’s lit against an inky blue sky: “It comes out of nowhere and gives you a sense of calm when it’s illuminated.” Saltwood has made sure that its interior proves just as inviting, with three distinct areas to be enjoyed: a sizeable dining room designed with rich Central California woods, metal accents, and overhead tungsten lights; a Sunset Deck overlooking the waves and wildlife; and a lively bar. At the heart of it all is a wood-fire grill, where Baron prepares a large portion of the menu. His culinary vision is proudly Central Coast; fresh, local ingredients drive the New American–style menu, which shifts with the seasons. He fosters strong relationships with local farmers, who stop by after the farmers market to see what he needs. “Whatever they have and give to me, I use to cook that week,” Baron says. As is fitting in a place with as storied and rich a fishing history as the Monterey area, the star of the menu is seafood. The experimental oyster bar is not to be missed, offering a variety of oysters, served grilled or raw with various sauces and toppings. Among Baron’s personal favorites is the seafood boil, a melange of mussels, clams, shrimp, lamb sausage, potatoes, grilled corn, and summer squash. From the fare to the view to the culture, Saltwood embraces the region and its bounty. There’s no wrong time to visit this Spanish-and-Mexican-influenced restaurant. Stop by in the light of day and look out for marine wildlife playing in the waters through the dining room windows; at sunset, when the stunning, panoramic ocean view becomes a rosy watercolor; or after dark, amid the warm glow of city lights. As part of the exquisite Post Ranch Inn, Sierra Mar is perched atop the rugged Big Sur cliffs, overlooking an expanse of empty sea and untouched coastline. Helmed by chef Elizabeth Murray, the award-winning, fine dining establishment boasts a menu that is meant to capture the singularity of the place and a wine program that draws enthusiasts to its breathtaking locale. Whether a visitor to The Bench opts for the open-air-style dining room or to be kissed with ocean mist on the outdoor patio, the view is front and center. 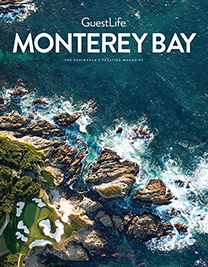 Meandering greens on one of the world’s most famous golf courses (and of the 18th hole, in particular), lush Carmel in the distance, and the blue waters of the Monterey Bay sandwiched in between provide an ideal backdrop. Pepperoni, salami, onions, and pepperoncini join forces with Kalamata olives and Asiago cheese on Heirloom’s deep-dish version of its Napoli. “Deep” is the operative word here. 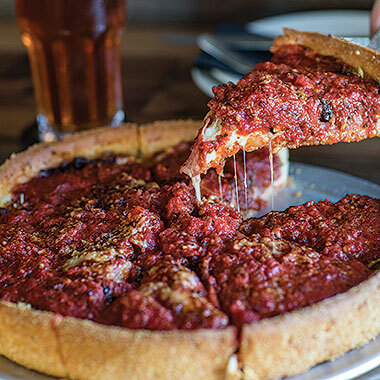 Deep as in Chicago-style pies so thick that two slices can overload some eaters. Deep as in the amount of experience enthusiastic owner-operator Michael Foley brings to making pizza, having started in the trade in 1987 as a Woodstock’s Pizza delivery boy. Deep as in a dynamic menu that goes beyond the Chicago-style flagship thick pizza pies with appetizing alternatives such as “bomb” beets, roasted broccoli, arugula salads, thin-crust and gluten-free pizza choices, as well as a diverse wine and craft beer list. Deep as in the flavor on the namesake Heirloom pizza, topped with ricotta, Gorgonzola, garlic, mushrooms, bacon, and spinach. And deep as in the loyalty Heirloom Pizza Co. inspired among customers. Heirloom’s emblem is a tomato peace sign of sorts, and these pizzas do bring about love and kindness, as they are always shared among people who feel like they are enjoying something special. As Foley says, “If you’re not enjoying what you’re doing — or eating — what’s the point?” Now that’s deep. The indulgent dishes coming out of the kitchen at Julia’s won’t have anybody missing meat, including fried “oysters” (baby oyster mushrooms, that is), cauliflower “wings” (florets tossed in Buffalo sauce), and seitan on the smokehouse pizza. Salads reset the image of leafy greens; try the Iris Salad with roasted carrots, cauliflower, kabocha squash, butternut squash, yams, zucchini, pumpkin seeds, and a creamy tahini dressing. As comforting as the reliable crowd can be — a blend of visitors and longtime loyal followers — the food has it beat. It’s hard to go wrong with the beer-bacon tasting flight, the fried-chicken-ham-and-eggs plate, the smoked-salmon Benedict, the tasty Kobe sliders, and the artichoke fritters. The recently upgraded patio and beautiful custom bar add a nice touch. The newest entry on this list gives old-school Japanese techniques a contemporary Californian spark. The traditional side? Super-slow-cooked, high-quality ramen dishes. Artful presentation, evident in items like the vegan spicy-rice bowl, marries with an execution level befitting a high-end restaurant at this fast-casual spot.